Each of the eight principal Mixtec codices share significant portions of the same history, biography, genealogy, and ritual affairs. Codex Vindobonensis, for example, portrays the deeds of the original gods and ancestors, the dedication of religious festivals, and the establishment of the first kingdoms. Codex Nuttall, on the other hand, lists many of the same people and places, but casts them as the antagonists in a cosmic conflict called the War of Heaven as depicted on pages 3-4 and 20-21. Codex Nuttall also describes the rise to power of Lord 8 Deer, while Codex Selden details the biography of his rival - Lady 6 Monkey of Jaltepec. In Codex Bodley, the stories of Lord 8 Deer and Lord 4 Wind, 6 Monkeys son, seem to introduce over 400 years of subsequent genealogical reckoning for the PostClassic kingdoms of Tilantongo, Teozacoalco, Jaltepec, Achiutla, Tlaxiaco, and Zaachila. Codex Colombino-Becker joins 8 Deers biography to that of Lord 4 Wind. Most people have been introduced to the Mixtec codices through a widely distributed facsimile of Codex Nuttall. Actually this is a reproduction of the art work commissioned by anthropologist Zelia Nuttall for her 1902 commentary of the codex issued through Harvards Peabody Museum. Some scholars prefer to call the manuscript the Zouche-Nuttall because it belonged to the English Baron Zouche when Nuttall discovered it. The codex was later given to the British Museum where it is preserved today. Stunning in its radiant primary colors and detail, Codex Nuttall is also one of the hardest manuscripts to interpret. This is because much of the narrative is broken into several sections without any obvious guides to visually link the texts. Pictographs were painted on both the front, called the obverse (pages 1-41) of Nuttall and the back, called the reverse (pages 42-84). In order to assist the reader, the painter applied guide lines in red paint allowing one to follow the text in a boustrophedon or meandering pattern across the page. Nuttall reverse begins on page 42 with an account of 8 Deers parentage, his early conquests, and his meetings with oracles and other powerful personages who were instrumental in his rise to power. The story continues with the tragic death of his brother, 12 Movement, and a resurgence of the conflict between Tilantongo, 8 Deers kingdom, and Red and White Bundle, an age-old rival. Ultimately on page 81, we see Lord 12 Movement being stabbed to death in a sweatbath. Offerings are then made to his mummified remains under the supervision of 8 Deer himself on page 82. War is declared and 8 Deer attacks Red and White Bundle on page 83. It is here that 8 Deer captures the young Prince 4 Wind, son of his rival Lady Six Monkey. Four Wind was either spared by 8 Deer or he escaped. His complete biography after this event appears in Codex Bodley, pages 34-28. Codex Nuttall concludes on page 83-84 with the execution of Lords 10 Dog and 6 House, 8 Deers two half-nephews. Lord 10 Dog is shown tied to a stone and performing a gladiatorial combat against two jaguar warriors, while Lord 6 House has been strapped to a scaffold and is being shot with arrows by a priest wearing the ritual dress of a death deity. Nuttall obverse pages 1-8 relates the saga of Lord Eight Wind, ancestor of the dynasties of Tilantongo and Jaltepec. The story then shifts to an account of Lady 3 Flint and her daughter, pages 14-20. Nuttall pages 22-35 describe genealogical relations between Tilantongo, Teozacoalco, and Zaachila. Codices frequently relate contrasting points of view. While Nuttall reverse for example emphasizes the rise to power of Lord 8 Deer, Codex Selden details the dynasty of a neighboring kingdom called Jaltepec. The biography of Lady 6 Monkey, 8 Deers rival is featured on pages 6-8. Six Monkeys mother was a queen of a kingdom located to the north of Jaltepec while her father was a prince of Tilantongo located to the west. We follow Six Monkeys rise to power in much the same way as Lord 8 Deers. She consults many of the same oracles but the painters were careful not to reveal that 8 Deer was ultimately responsible for 6 Monkeys death prefering to show that her eldest son, Lord 4 Wind, even married 8 Deers daughter, while her youngest son continued the dynasty of her kingdom at Jaltepec. Allusions to the violence that divided Mixtec royal families is glossed over. Codex Bodley fills in many of the blanks in the biographies of 8 Deer, 6 Monkey, and 4 Wind. Because early scholars did not know the original reading order, the page numbers can be slightly misleading. Bodley obverse begins with a list of early ancestors and their kingdoms dating back to the ninth century. There is a brief account of the War of Heaven on pages 3-4 followed by a genealogy for the first dynasty of Tilantongo on pages 4-5. The dynasty ended with Lord 2 Rain who is shown killing himself in the top band of Bodley page 5. Pages 6-14 next detail the rise to power of Lord 5 Crocodile, high priest of Tilantongo, followed by a condensed version of the biography of his son, the famous Lord 8 Deer. Eight Deers murder is shown at the bottom of page 14, and the subsequent pages of the codex relate the genealogical descent of the royal house of Tilantongo up to the time of the Spanish invasion of Oaxaca around 1520. Pages 40-21 of Bodley reverse, on the other hand, describe the ancestors of the royal house of Tlaxiaco, a 16th century rival of Tilantongo that traced their origins to a different set of ancestors born from the rivers of Apoala. The genealogy extends over pages 40-37 where we are introduced to the Lords of Red and White Bundle who feuded with Tilantongo in the eleventh century. A short biography of Lady 6 Monkey is included before we see her marriage to Lord 11 Wind of Red and White Bundle. The birth of their son, Lord 4 Wind, is shown on page 34. A saga of Lord 4 Wind follows on pages 34-31. His descendants ruled a kingdom, Place of Flints, at the southern end of the Tilantongo Valley. This site is known today as Mogote del Cacique, and has carried this name for several generations. Bodley pages 28-22 then describe the genealogies of Tlaxiaco, and its ally Achiutla, up to the time of the Spanish invasion in much the same way as Bodley obverse. Pictographs were painted on both the obverse (pages 52-1) and the reverse (pages 1-13) of Codex Vindobonensis, or Vienna as it is sometimes called. The reverse is the side that features a genealogy of kings that parallels Codex Bodley, including references to Lord 8 Deer of Tilantongo. Despite its refined execution, Codex Vindobonensis obverse on the other hand is difficult to interpret. There is little if any functional chronology to go by and anthropological knowledge of Mixtec ritual and religion is limited. Pages 52-47 give us an account of the creation of the world and the first ancestors. Lord Nine Wind is featured on page 48-47 descending from the sky to separate the sky from the waters and the earth at Hill of the Rain God or Yucuñudahui. The Mixtec landscape is revealed for the first time on pages 46-38 as a list of place signs signifying the principal kingdoms. Tilantongo, Jaltepec, Red and White Bundle, and Place of Flints are shown on page 42 as neighboring lands. Page 37 shows the first ancestors who were miraculously born from sacred trees followed by the royal marriage of a man and woman from Apoala on page 35. Pages 34-24 detail the establishment of feasts and rituals such as the mushroom ceremony on page 24. On page 23 is an account of the rise of the sun for the first time, followed by scenes of the five world directions extending across pages 22-11. North appears on page 21 as Checkerboard Hill, East appears on page 18 as Hill of the Sun. West appears on 17-16 as Ash River and South appears on page 15-14 as Skull Temple. The Center direction appears on 12-11 symbolized by sacred caves represented by the double-headed crocodile jaws. Pages 10-9 illustrate rituals for the establishment of kingdoms in the vicinity of Yucuñudahui, a large archaeological site located in the northern end of the Nochixtlan Valley. More place signs, temples, and palaces appear on pages 8-1. Despite the fact that there is little chronology per se, scholars believe that the dates signify the times when important feasts and rituals were to be carried out at the place signs portrayed. The Mixtecs rose to power in southern México during Mesoamericas PostClassic period between A.D. 950-1521. Formulating alliances with the Tolteca-Chichimeca to the north (largely Nahua and Popoloca speaking peoples) together with the Zapotecs to the east, Mixtec kings and queens used royal marriage to extend their influence over much of what are today the Mexican states of Oaxaca and Puebla. By the time of the Spanish invasion, the highest ranked royal Mixtec dynasty resided at Tilantongo. The Mixtecs were formidable enemies of the Aztecs whose capital was Tenochtitlán located in the Valley of México and they fought many wars against Aztec imperial armies throughout the fifteenth century. There are over a quarter million Mixtec people still living in Oaxaca today. Most subsist by farming. 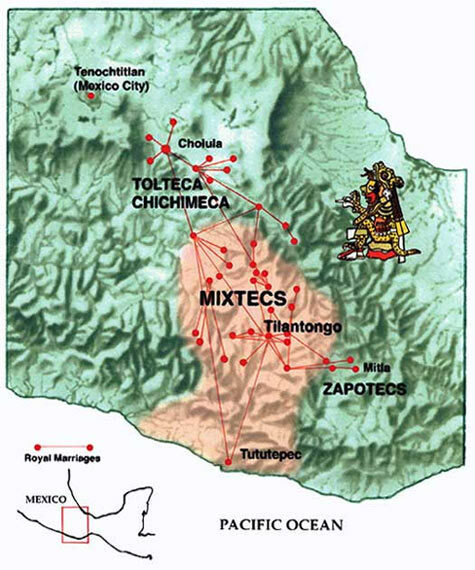 The term Mixtec is actually a Nahua-Aztec word. The Mixtecs called themselves Ñuudzahui or "People of the Rain" in their own language.